With well over 700 clients, and delivering 10 Million emails per day, smartFocus is a thought leader of intelligent proprietary software focused on leading edge digital marketing services that provide intuitive email, rss, sms capabilities. 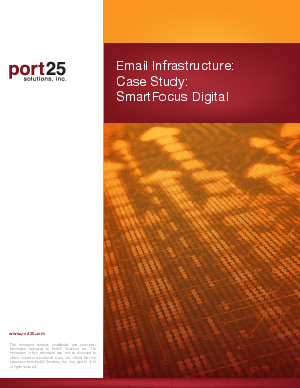 Having originally installed multiple instances of Microsoft SMTP as provided by Windows Server, smartFocus pursued a comprehensive email sending infrastructure solution that would effectively scale, provide the latest email authentication capabilities and support rate limiting for enhanced deliverability to different ISPs. After evaluating PowerMTAT from Port25 Solutions, smartFocus' digital messaging objectives for enhanced inbox placement became a reality.